Next up on my exploration of Rotterdam’s food and drink scene is Restaurant Chung. For eight years already the restaurant has occupied its own tiny island in the city centre, just a few steps from the Meent and Stadhuis. 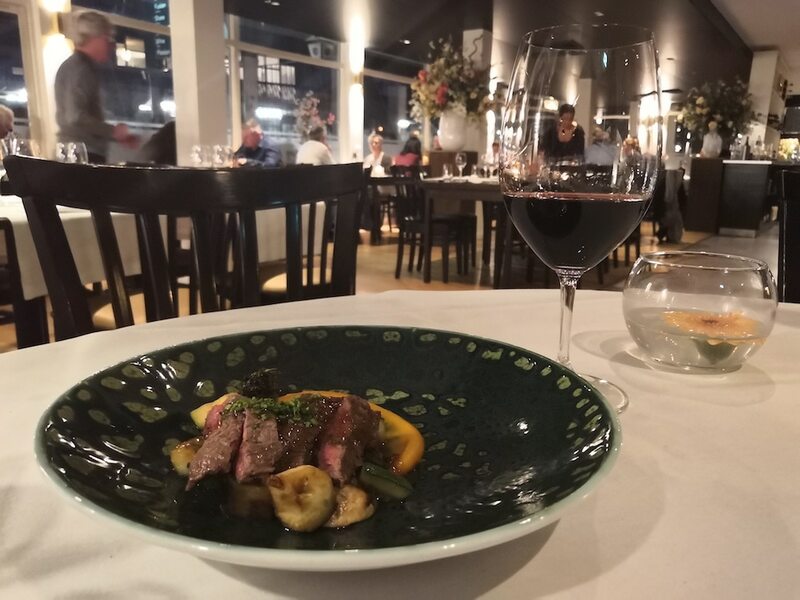 The restaurant is run by Chef Chung Wai Liu – a Rotterdammer born and raised with Asian origins. We were invited to sample his refined fusion of Asian flavours and European cooking techniques, including signature Peking duck, on a clear winter night. Read on to see how it went. 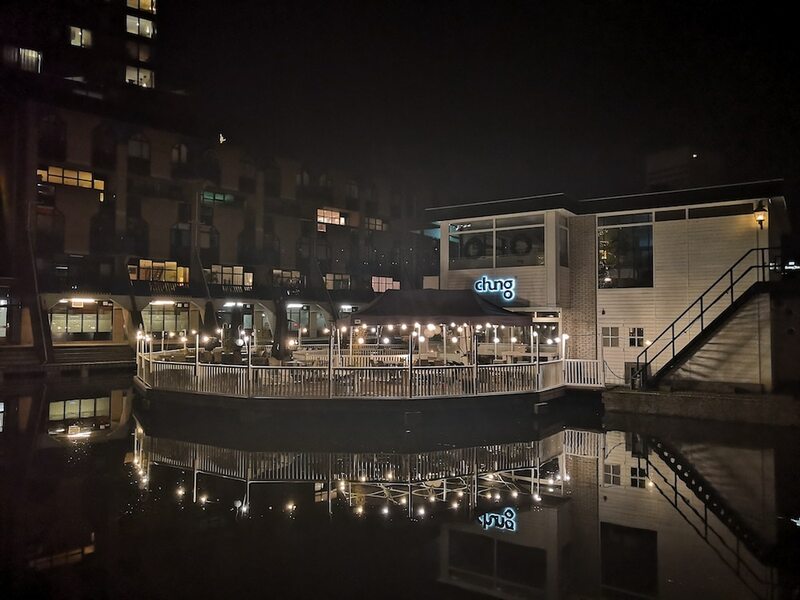 As we approached the restaurant on a dark Sunday evening, the large terrace’s strings of lights were shimmering in the ripples of the canal that surrounds its little island. We skirted the water and walked around the back of the distinct-looking building to find the entrance. As soon as we pushed open the doors, we were welcomed with warm smiles and ushered to our corner table overlooking the other diners already present. As more small groups of twos and threes trickled through the entrance, the restaurant was filled with the low murmur of chatter and gentle clinking of cutlery, over a soundtrack of acoustic pop songs. Added to the low lighting, dark woods and white walls adorned with wine bottles and glasses, the atmosphere felt both refined and relaxed. 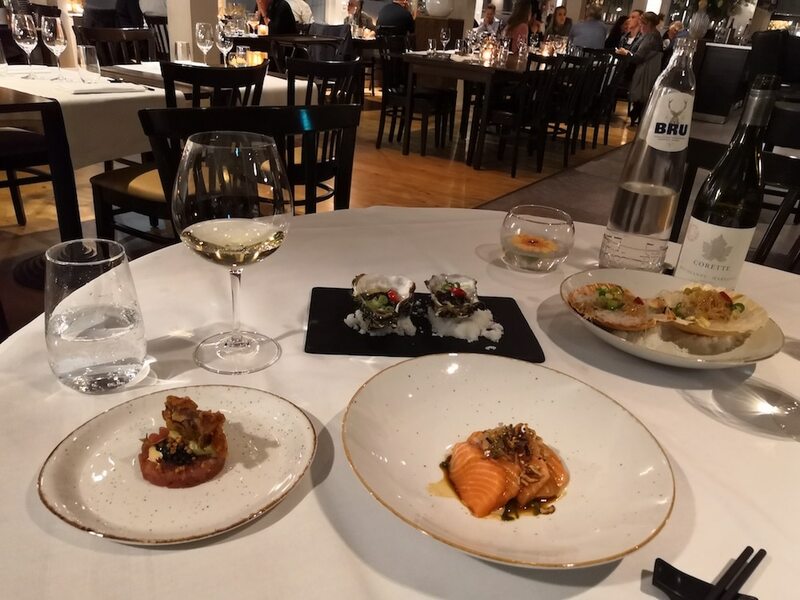 The team kicked off our evening with a feast of warm and cold seafood classics with a Chung twist: tuna tartare with avocado and wasabi cream, steamed oysters with black bean sauce, salmon sashimi with crunchy rice, and steamed scallops with garlic noodles. Then came Chung’s beautiful cod dish complemented by chicken broth and coconut sauce, a shrimp dim sum, purple broccoli cream and minced Chinese sausage (for a touch of liquorice flavour). We already spotted the signature Peking duck making its way around the restaurant, but now came our turn. A tray was propped up alongside our table, then out came the glistening duck, paper-thin pancakes, crunchy cucumber and Chinese cabbage, and hoisin sauce filling. Our host expertly carved the duck and assembled the pancakes in front of us, leaving behind two juicy wraps of tender duck and crispy greenery each. After the table theatre came two more courses. First, a dish of succulent kalfssukade (braised veal shoulder) and sweet vegetables. And finally dessert: lemon panna cotta, sesame seed ice cream and sesame seed chocolate, salty pearls and green tea crumble, topped by a chocolate stick and pistachio macaron. It looked and tasted so good we dug straight in and finished it all up before even thinking of taking a photo! Recommended dish: The Peking duck may be Restaurant Chung’s signature dish, but for me the cod was the star of the evening. 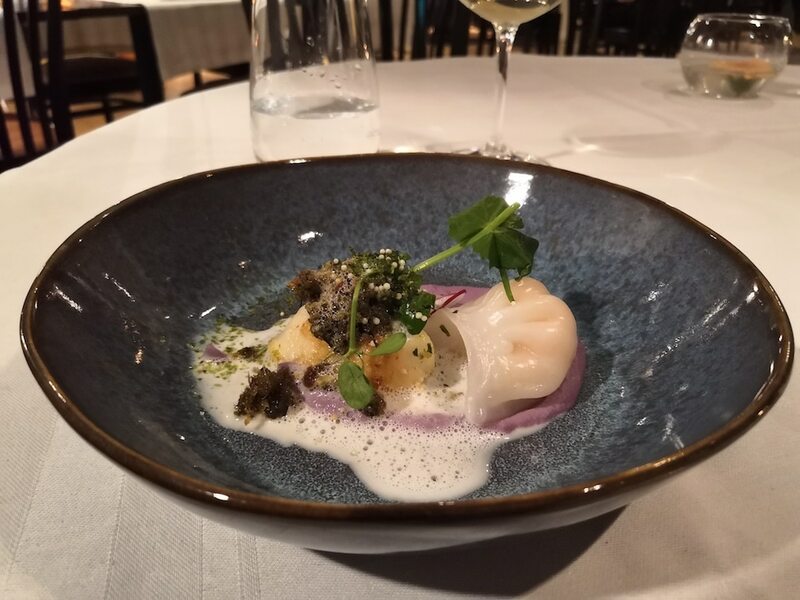 A beautiful, intricate and unique dish, it stands out from the standard cod-foam-asparagus combination served by so many restaurants, bringing something very new to the table – quite literally. I also really enjoyed the steamed scallops topped with rice noodles, as again something I had never seen or eaten before. Then of course, that dessert: certainly indulgent, but also light enough that we managed to finish it even after such an extensive foodie spread. Yes, it is perfectly acceptable (and indeed typical) to eat the Peking duck pancakes with your hands (street-food style). But chopsticks can also work if you prefer – I asked so you don’t have to! A sommelier himself, Chef Chung offers an extensive wine list, from which we sampled a white and a red. A Corette Roussanne – Marsanne with a hint of saltiness to complement the soy flavours of the seafood dishes. And a South African Pinotage from Chung’s concise selection of open wines to accompany our meat dishes. Aside from enjoying wine with your dinner as we did, you can also simply stop by the restaurant on a sunny day for a glass of wine on the terrace overlooking the water. Restaurant Chung offers a tranquil setting filled with fine foods and surprising flavour combinations. It’s a great place to take out your (grown-up) family for a relaxed evening out, or close group of friends who enjoy the finer foods in life. Perhaps not an especially intimate venue for a romantic date, the large outdoor terrace can still provide a welcome respite from the bustle of the city for couples, friends and groups alike. Being a rather unique venue in an unexpected location, taking that first step inside Chung might seem daunting for some. 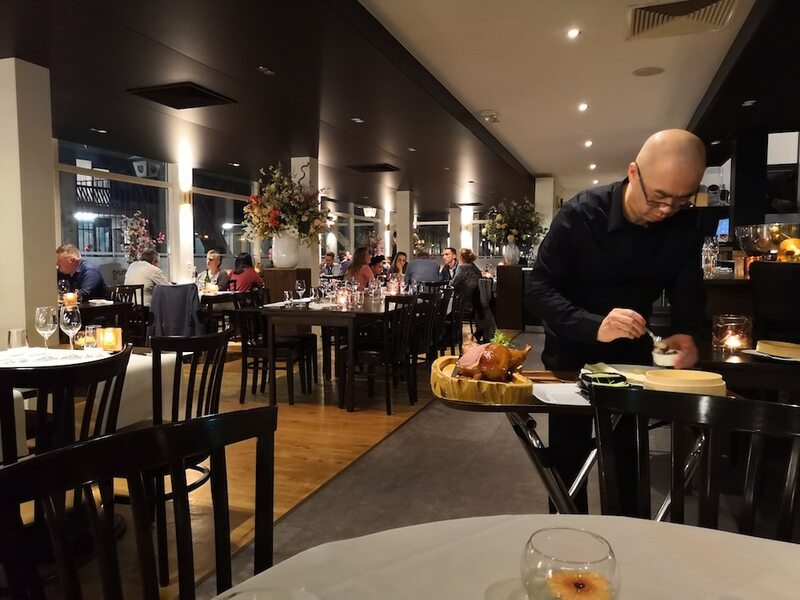 But as soon as you do, you’ll straight away feel at home in this welcoming Rotterdam restaurant. Average price: Between €35 and €50 per person for a 3 to 5 course menu (respectively), plus €5 to €7 for a glass of wine.